Publisher: EA. Developer: EA Black Box. Sequel-itis is a perilous condition. Severe cases can result in a limited development cycle and stymied creativity, but perhaps more terminally for the game in question, it plants negative associations in the minds of players. A new Need For Speed comes and goes every year, meaning it’s all too easy to assume that each will be rushed out, with all the baggage that this implies. But how about a fresh perspective? In 2011, Black Box released their first full, new NFS title in three years, and the first console racer of any description to utilise the potent Frostbite 2 engine. Whilst previous instalments Shift and Hot Pursuit dealt in circuit racing and cops ‘n’ robbers chases respectively, The Run sets its sights on a pure, back-to-roots arcade driving experience. If we’re honest, EA used up all their hype tokens securing the development services of Criterion for the excellent, if a little reserved, Hot Pursuit. Following in its wake, The Run found plaudits harder to come by, but with so much more variety, cohesion and heart, it’s much more than a standard sequel. Arguably, it’s the game Hot Pursuit should have been. It’s like the ultimate retro racing love letter, dressed in high-end, high-gloss modern racing overalls. Mimicking Outrun’s epic transamerican road trip, The Run leads you on a ferocious, fifty stage coast-to-coast race in a 200-strong field spanning more than 300 kilometres. But whilst Outrun was to become famed for its evocative scenic shifts, The Run takes things a step further, with the nature of the driving itself evolving over the course of this epic journey. Diversity is the name of the game and there are few, if any, checkpoint-chasers that can claim to have offered so many styles, and to such an unerringly cohesive, strong standard. It should come as no surprise that The Run plays really well in the most fundamental sense; borrowing Hot Pursuit’s pleasantly weighty handling model, this peach of a game engine is lightning-fast, smooth, and marks a welcome return of Burnout-style rewards for driving on the limit. Replenishment of nitrous boost is accelerated as you drive into oncoming traffic, execute slides, utilise shortcuts and survive near-misses. Perhaps unsurprisingly then, it’s able to easily recreate the feel of the long canyon stretches and dustbowl straights that populated Criterion’s racer, but that’s merely the tip of the iceberg in a game that reveals itself to be considerably more ambitious. Now that's a racing objective we can all relate to: drive fast. Driving fast is all well and good, but how about navigating the busy night-time industrial complexes of Ohio, or the narrow, winding suburbs of Pennsylvania, chancing the occasional trip through barns and fields in order to gain a short cut? Without ever straying too far from its core strengths, The Run is constantly giving the player new looks, and it likes hairpins as much as it does straights, with some of the best routes requiring deft use of the handbrake. The Colorado Rockies prove the standout, with smartly acclimatised environment physics seeing cars troubled by protracted braking periods and the very real danger of skating off on icy patches. The vast array of stages are bookended by California and New York, which come to represent the series’ old heartland if you will, with heart-stopping charges through traffic-packed streets. The feeling of control is superb, the sensation of speed blistering. The fact that it all gels together at such a consistently good standard guarantees a remarkably varied and enduring arcade driving experience that’s challenging and eminently rewarding. 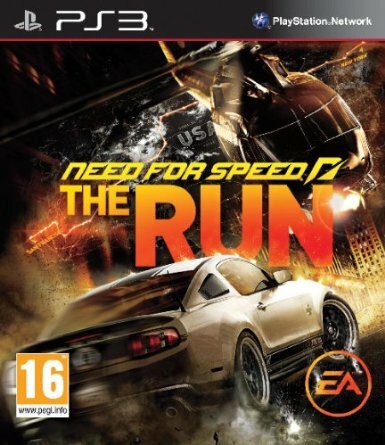 The Run itself, which sees the player battling through a 200-strong field of competitors, features a Fast and the Furious style yarn to offer a gentle narrative impetus missing from similar games. The Speedwall is a wonderful old-skool addition, ranking the player amongst their friends, and topping the leaderboard comes to have that same magnetic allure as so many great racers of the late eighties and early nineties. It’s likely the weakest of the three main game modes, with a smattering of QTEs and a couple of irritating stages that see the player being pursued and shot at by the mob which, honestly, the game would have been better off without. Neither of these are what you’re after from a racing game of this nature, but nor will they form part of your abiding memory of it, as they’re luckily few and far between. All the hard work crafting such an elaborate selection of cars and routes really pays dividends in the Challenge series and Online though. Challenge is a time-attack style mode where the player races against the clock (and occasionally police and rivals) to attain medals. Attaining golds grants new cars and trophies, and they prove super-addictive. There are more than fifty to tackle, and unlike DiRT or Grid, there isn’t a reliance on the repeated, recycled use of tracks under a mish-mash of different racing rules. In fact, there’s none whatsoever; each and every challenge has its own route, which is hugely impressive (and likely almost unique) amongst modern racers. As with so many aspects that characterise The Run, it’s the simplicity of the Online suite that proves its strength. Joining games proves fluid, quick and easy – there are no empty lobbies or hit ‘n’ miss playlists getting overlooked. It’s all built on standard races of up to eight players, with a fantastically expansive mix of series’ and vehicle classes meaning few sessions are ever alike. Racers can join not only mid-series but mid-race, so there’s no depressing waits in clinical menus waiting for like-minded competitors. Tellingly, racing Corollas and Golfs around dirt trails proves just as compelling as unleashing Porsches and Lamborghinis on the freeways, as does risking muscle cars in the icy mountains, or seeing how well an Audi Quattro handles twisty city streets. The secret to this is the game's exquisite performance balance, in a genre notorious for frustrating multiplayer suites that are often rendered hopeless to those short on horsepower. The twitchy physics, ragdoll crashes and performance deficits faced by anyone lacking a tuned Murciélago that served to mar Shift online are thankfully a thing of the past. The car roster is utterly brilliant – not based on size alone, though there are dozens to earn – but because absolutely every last one of them is potent in the right hands. Rewards are numerous and well-handled, and the ability to race, and be rewarded, within a group of mates is a really cool, and very successful, feature. It may be a given these days that every new Need For Speed will look great, but whilst it might not come as a massive surprise, the fact remains The Run is among the most attractive racers on the PS3. Some of the distant scenery can lack a little sharpness at times, but given the amount of road there is map, there’s a remarkable amount of detail hidden away in places you’d only think to look for in the Photo mode, and despite the odd texturing hiccup, the good far outweighs the bad. Crash physics are all you’d expect of an EA racer, whilst cars look resplendent both on-track and in their showroom-esque menu displays. Black Box score top marks for variety in design, with a far greater, more refined palette on show than in any of The Run’s predecessors, making excellent use of weather effects and night time scenarios. There are a few niggles here and there; perhaps the most undesirable being some lengthy load times, and a peculiar need to repeat the loading sequence should you opt to restart a stage from the pause menu. The sound could have been better; it's not bad, just inconsistent. Some of the BGMs are fantastic; straight out of an action movie and incredibly dramatic, but though there’s a credible mix of genres, some of it is pretty forgettable. The most balanced, varied, and extensive Need For Speed to date, The Run may not have grabbed the headlines but, to look back on it clinically, it does everything the already-decent Hot Pursuit did, but better. I've returned to The Run on and off for months for its online and challenge events, and whilst the street-racer story won't be to everyone's liking, it's indicative of a game that's eminently more engaging than it's more recent stablemates. More importantly, there's a huge amount of content and a great deal of enjoyment to be had from a very complete game, and one that's the sum of its considerable parts. Now the online pass is free, there's no reason not to give this underrated gem a spin.